I’ll admit The Guernsey Literary and Potato Peel Pie Society (henceforth known simply as Guernsey because that is the longest title ever and I don’t want to type it again) was not on my radar. And then the movie came out on Netflix and I was immediately intrigued. I mean, a historical movie starring Lily James and Daario Naharis Michiel Huisman? I need it. And like any movie adapted from a book, I knew I needed to read the book first. What I wasn’t expecting was that I would love the book so much all I wanted to do was rush home immediately and watch the movie. So, I decided to review both today! It’s no secret I love novels set during or around WWII, especially in England (I’m an anglophile, what can I say?). Guernsey is exactly that and more. It’s a wonderful novel that illustrates the hardships ordinary citizens dealt with during the war, but it’s also a lovely, warm, and fuzzy love story. I really appreciated how well this book showed how hard it was to just do normal things while the rest of the world was fighting each other. Yes, similar events are currently going on in the world, but when was the last time any of us knew someone whose apartment was destroyed by a bomb? It’s not quite as close to home for most of us, and reading stories like this is a great reminder of what it once was like, and what it is still like for people in other parts of the world. That part of the story really touched me, and it was easily one of my favorite aspects of the book. While I truly loved this story, and how it was told, there are a few minor things that kept Guernsey from being a five-star read for me. Unfortunately, Mary Ann Shaffer passed away before completing the book, so that might be why this book felt a bit incomplete to me. Her niece finished it before publication, but it just felt like there was something missing. I felt like the main part of the story could have started a bit sooner, and I thought the ending was a bit too abrupt (even though it contains one of my favorite lines ever). I think I just wanted more of the story, and it wasn’t there. But that’s really my only complaint about this book, and it’s not the end of the world. As for the adaptation, I thought they did a really great job. Obviously, a few things were changed – it’s hard to make a movie out of letters. I do think the changes they made worked really well, and I was really happy with how they told the story. Honestly, they kept my favorite line, and that was kind of all I cared about. This feels like the kind of movie I can turn to whenever I’m having a bad day. BUT, it was a little bit too long and kind of slow. I felt like it could have been less drawn out in certain parts. I watched it after a long work day, and barely made it through without falling asleep – no fault of the movie, I’m just turning into an old person who passes out at like 8:30 every day. But it was a good movie. I would definitely recommend reading the book first, but it is worth watching if you’re looking for a good movie. ★★★★☆ – I am so glad I read Guernsey! It was a really enjoyable story that had a lot of depth. It’s a great historical fiction novel, and I love that it was told through letters – epistolary novels are always interesting when they’re done well. If you enjoy historical fiction, I would highly recommend this one. Just know you will want to immediately watch the movie after you’re done. 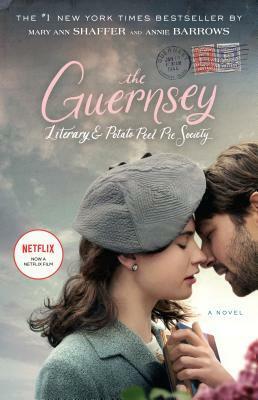 The Guernsey Literary and Potato Peel Pie Society is available in stores now – pick up your copy on Amazon or in Target. To get the audiobook for free, use this link to sign up for a free trial of Audible and choose Guernsey as one of your two free books. This book was generously provided to me by Random House. All opinions are my own. Thanks! If you liked the movie, I think you’ll definitely like the book! They’re both so cute. I loveeeee this book, and am so excited for the film! Out of curiosity, what was the line you were happy they kept? (Spoiler alert for anyone else reading this) It’s “Would you like to marry me? I’m in love with you, so I thought I’d ask.” I’m sure they kept others, but I just really love this one. Ahhh yes I loved that. Such a mushy story. So good. This book made me SO HAPPY oh my God. Except the ending… I felt it turned the whole novel into a love story, which isn’t what it was marketed as. I actually liked the ending, but it did feel too abrupt. I think it might have been better if they’d included more about the book club in the ending, so it felt like the love story was just part of it, not what the rest of the book was leading up to.